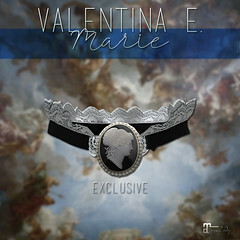 Valentina E. – Valentina E.
NEW! Valentina E. Vivienne Ensemble @ The Arcade! Out now at The Arcade our new Vivienne Gacha set inspired by the iconic British designer, Vivienne Westwood. Classic British style meets punk in these Gacha set that you can dress up or down. Exclusively for Maitreya Lara at this special event. Out now at a brand new event, Sultry, our new Valentina E. Florence Dress! This pretty dress features oversized full sleeves, a tea length skirt, and bow tie at the waist. Available in six color options, exclusively for Maitreya Lara. NEW! Valentina E. Carrie Ensemble @ FaMESHed! Out now at FaMESHed our new Valentina E. Carrie Ensemble featuring an oversized cable knit sweater and long pleated skirt. Available in six color options. The Fatpack HUD allows you to mix and match.Exclusively for Maitreya Lara, only at this special event. NEW! Valentina E. Juliet Dress @ CUPID! Out now at CUPID our new Valentina E. Juliet Dress featuring a cross body drape, beautiful lines and heart charm and safety pin details! Available in six color options, exclusively for Maitreya Lara. Mix and match the dress and sash colors with the Fatpack. Don’t miss it! NEW! 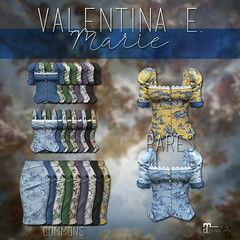 Valentina E. Gwynnie Separates @ Shiny Shabby! Out now at Shiny Shabby our new Gwynnie Trousers and Open Shirt, exclusively for Maitreya Lara! The shirt works perfectly with the Maitreya Bra that came with your body, or choose your own lingerie..or maybe go bare! NEW! Valentina E. Jones Dress @ FaMESHed X! Out now at FaMESHed X our new Valentina E. Jones Dres, inspired by the fashions of the iconic Grace Jones. Available in six colors for Maitreya Lara. NEW! Valentina E. Mia Tank Dress @ Equal 10! Out now at Equal 10 our new Valentina E. Mia Tank Dress! Wear it with your favourite kicks, Dr Martens, or dress it up with heels! Available in four color options, exclusively for Maitreya Lara. NEW! Valentina E. Killer Dress For Naughty or Nice! Out now at our Main Location, our new Valentina E. Killer Dress for the Naughty or Nice Mainstore Shopping Event! Grab a HUD and check out the amazing designs from shops all over the grid. Available in six color options, exclusively for Maitreya Lara.